Kostov, known for the hits Beautiful Mess and The One (I Need You), has been singing since the age of 6, first in the group Neposedy, and after 2011 as a solo artist. He finished as runner-up in X Factor Bulgaria, the country which he represented in the Eurovision Song Contest 2017. His voice earned him comparisons to singers like James Arthur, Justin Bieber and Ed Sheeran. 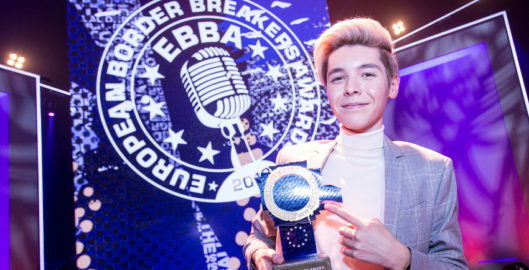 Kristian Kostov takes over from last year’s winner Dua Lipa. The EBBA show also featured outstanding performances by the following EBBA 2018 winners: Alice Merton, Alma, Blanche, Kristian Kostov, Off Bloom, Sigrid, Skott and Youngr. Salvador Sobral couldn’t attend the show due to his health condition, therefore his manager accepted the award on his behalf. Over the coming year the EBBA TV show will be broadcast by several European public channels. Highlights of the show can be watched through the EBBA’s YouTube channel. Every Friday at noon the European Border Breakers Charts (EBBC) are published. The charts for new and up and coming European artists who are successful beyond their home country. Music streaming is becoming increasingly important in the discovery of new artists, therefore, from 2018 onwards, airplay data supplied by Radiomonitor will be combined with available streaming data to determine the chart, making the EBBC even faster, even more complete and even more relevant. It is the essential source of information for anyone who would like to stay up to date with European music. Next to the combined-data Top 100, the EBBC now also presents an Airplay Top 100 and Streaming Top 40. Additionally, the EBBC’s Tips by Country chart highlights up and coming tracks whereas the Top Tracks by Country gives an overview of the most successful tracks per country. For each song you will be able to find out in which country its hit potential is growing, and all the songs can also be listened to by using our unique play/share button. This makes europeanborderbreakerscharts.eu the place to be to discover new European talent! Each and every Friday.